The eastside area around Glenfield and Roseberry looks like many Detroit neighborhoods ‒ flower pots hanging from tidy porches, empty houses rotting in wild grass, residents asking why they have to live like they do. Yet Glenfield and Roseberry stands out in important ways from the vast panorama of abandonment that stretches for miles in this section near the old City Airport: It’s got a nucleus of activists who have refused to sit back and watch their neighborhood decline. In post-bankruptcy Detroit, anonymous neighborhoods like this can’t afford to await a city rescue if they hope to survive. With money remaining tight, the administration of Mayor Mike Duggan has been forced to perform triage, favoring some areas with intense demolition over other communities. The neighborhoods getting immediate relief tend to have well-established names like Grandmont Rosedale, Brightmoor and Marygrove, yet they comprise only a fraction of a city that sprawls over 140 square miles. More typical are scores of nameless, obscure neighborhoods like the area near Glenfield and Roseberry, places torn between pleading for help and finding a means to rebuild what they can on their own, while their fate remains in doubt. Planning officials have suggested letting some declining areas -- including the blocks around Glenfield and Roseberry -- continue to lose population and targeting the land for alternative uses. Bridge Magazine is convening partner for the Detroit Journalism Cooperative (DJC), comprised of five nonprofit media outlets focused on the city’s future after bankruptcy. The group includes Michigan Radio,WDET, Detroit Public Television and New Michigan Media. Support for the DJC comes from the John S. and James L. Knight Foundation, Renaissance Journalism’s Michigan Reporting Initiative and the Ford Foundation. To meet its biggest challenge – blight – Glenfield and Roseberry will receive no significant assistance from the city any time soon. Some residents realize that. And while they don’t like it, they are not waiting around. They’ve branded the area with a name – Eden Gardens – started an actual vegetable garden, formed alliances with the outside world – including a Jewish congregation downtown -- and never stopped dreaming of creating a sustainable neighborhood with stores, services and security. “We don’t rely on the city. We rely on the community,” said Karen Chava Knox, president of the Eden Gardens Block Club and a prime mover behind the changes. Eden Gardens has a small footprint, 16 blocks, consisting of four main streets – Wilfred, Glenfield, Kilbourne and Rosemary. It’s bordered on the east by Dickerson and on the west by Gratiot Avenue. Coleman A. Young Municipal Airport sits three blocks to the west. Duggan himself showed up in Eden Gardens on May 5 as part of his ongoing visits to neighborhoods across the city. He met with residents in the home of Polly Jones, another activist, who has lived on Glenfield for more than 35 years. The mayor was already popular in the area: There are powerful new streetlights, workers are repaving Kilbourne Street and the red Rizzo garbage truck arrives like clockwork every Wednesday. A neighborhood police officer from the nearby Ninth Precinct station, Abraham Blue, gives residents his cell-phone number. Duggan listened to the residents but made no big promises, they said, though he gave assurances the city would help them negotiate the bureaucracy to buy vacant land for gardens or side lots. When residents brought up a couple of dilapidated homes they believe must be demolished, the mayor was less certain. Please consider making a donation to support Bridge Magazine. THANK YOU! Eden Gardens is a microcosm of the city at large when it comes to abandonment, which is a problem that far surpasses broken streetlights or bumpy roads in complexity and magnitude. 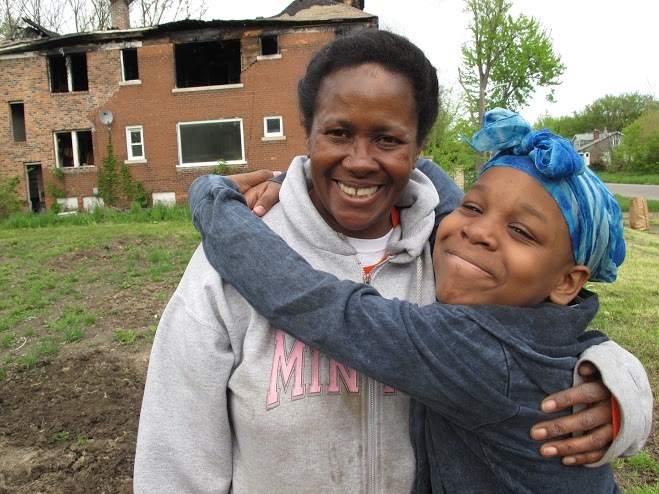 By one estimate, Detroit has more than 84,600 blighted properties. They could cost $850 million to demolish – a task of staggering proportions, especially for a municipality scrimping for every dime. The city currently is using $100 million in federal money to tear down homes, and officials have decided to target areas where they believe the money will do the most good: Densely populated neighborhoods that have the best chance of being saved. “The strategy is to stabilize the stronger neighborhoods,” said Duggan’s spokesman, John Roach. On the east side, that includes East English Village, Morning Side and Osborn, neighborhoods that have organizations, name recognition and, in some cases, help from organizations such as Habitat for Humanity, foundations and corporations. Those neighborhoods serve as a template for how Eden Gardens is trying to make its name. But residents can’t do much on their own about blight. On Wilfred and Glenfield, nearly half the houses are abandoned or in severe disrepair. They will have to wait for a concentrated demolition attack. How long? No one knows. “We have very limited funds that we can utilize to demolish properties in areas like that,” said the land bank’s Fahle. One exception is homes damaged by fire; they might be torn down using money from a city fire escrow fund. Otherwise, there is money to demolish only structures that present an extreme danger to the neighborhood, such as those that appear on the verge of collapsing. Delores Brewer, a 78-year-old widow who has lived on Glenfield since 1973, was impressed by Duggan. “I’ve never seen a mayor who would come and sit in someone’s home,” she said. But Brewer, who lives in a meticulously maintained bungalow, said the neighborhood will continue to deteriorate unless the city can get control of Eden Gardens’ empty properties, which includes stopping scrappers, who pounce on homes and strip them of valuable metal and fixtures the moment they’re vacated. “We’re like the forgotten part of the city,” she said. The lack of attention from city hall over the years, which allowed Eden Gardens’ abandoned-home problem to metastasize, spurred Knox into action. Knox, the block club president, who cheerfully declined to give her age, grew up in Royal Oak Township and earned a degree in performing arts from Marygrove College. She moved onto Glenfield – what she recalled as a “beautiful area” – in 1978, as the flight of middle- and working-class whites was getting underway, a half century after the neighborhood was built during the city’s roaring 1920s. She – and other longtime residents – attributes the neighborhood’s decline to the closing of nearby Catholic schools; the transition from wide-scale homeownership to rentals; the loss of jobs; crime and drugs, especially the crack epidemic in the 1980s. More recently, predatory lending led to the abandonment of more homes. The U.S. Census area that includes Eden Gardens lost almost half of its residents between 2000 and 2010. In 1998, Knox moved to Los Angeles to look for a job in the entertainment industry, but returned to her home on Glenfield in 2009. She got busy. By August of 2009, the neighborhood had a name and an organization. Knox is African American, but she said she always felt Jewish, so she converted to Judaism and joined the Isaac Agree Downtown Synagogue, where she met Blair Nosan, who grew up in West Bloomfield. Nosan, 30, recently received a master’s degree in Jewish education from the Jewish Theological Seminary in New York City, and she is interested in food issues and the connection between Judaism and agriculture. “Karen told me, ‘I want to start a garden,’” Nosan recalled. That was four years ago. It was next step in the neighborhood’s development. Nosan and Knox collaborated on Eden Gardens’ garden, which occupies three empty lots on Glenfield owned by the Detroit Land Bank. Abandoned homes border the garden on the left, right, front and back. The Jewish Women’s Foundation of Metropolitan Detroit backed the garden with an $8,000 donation, and this summer will be its third growing season. Volunteers recently planted lettuce, onion, cabbage, kale, strawberry, garlic, sweet potatoes and mustard greens, and they’ve constructed a wooden structure that will allow rain to be captured and reused in the garden rather than running off into the city sewer system. On a recent afternoon, children and adults from the neighborhood and one volunteer from the synagogue, Noah Purcell, pulled weeds and laughed at each others’ jokes. “It’s become a part of the week I look forward to,” said Purcell. Young people from the Oakland County Jewish community also volunteer; they and the neighborhood kids have begun texting after meeting at the garden, Purcell said. One recent day in Eden Gardens, kids skateboarded and roller-skated after school buses dropped them off on corners in front of homes with crumbling porches and broken windows. Three children in school uniforms stopped in front of one abandoned house on Wilfred and threw small chunks of cement at it. Over on Glenfield, a man who identified himself as Nate, 44, worked on the lawn in front of the two-story flat he is fixing. It sits between two abandoned structures. He says there is less crime and less trash on the streets, and expressed confidence the neighborhood will come back. Down the street, Nirva Bradley, 39, an immigrant from Belize, called Officer Blue’s cell because a neighbor’s dog was loose on her lawn. The dog, a tiny Chihuahua, posed no threat, but it provoked Bradley’s watchdog, a boxer-pit bull mix named Stoopz, who is stationed inside the house. Stoopz tends to break windows in his owner’s home when it tries to get at the trespassing dog. On Wilfred, William Godbolt, 65, cut the lawn in front of his home. He also cuts the grass in the neighborhood’s vacant lots, but his sit-down mower was broken. When he sees scrappers checking out a freshly vacated home, Godbolt has been known to confront them. The residents of Eden Gardens told Mayor Duggan they would like to see some new businesses on Gratiot, the thundering, nine-lane state highway with meager commercial offerings that anchors their community. They are thinking of a big-box store, a food market and restaurants, though a mayor can’t snap his fingers and make those businesses suddenly appear. The Burger King that was on Gratiot for years is closed and its lot is weedy, but someone is rehabbing the local coney island. The burden of blight in Eden Garden makes staying a problem for many people, and even some of the activists say they would move if they could. They stay because even good houses in the neighborhood are going for less than $15,000. Still, word on the street is someone bought a home recently for a few thousand dollars and will be moving in soon. While they like Duggan – who ran on the slogan “Every Neighborhood has a Future” – residents interviewed say they are frustrated he hasn’t articulated a strategy for neighborhoods like theirs, which are badly hurting. What plans does the city have for the future urban meadows around the verdant-sounding intersection of Glenfield and Roseberry if all the abandoned buildings are demolished someday? The mayor has talked about creating so-called green infrastructure, such as rain-retention ponds and farms. He also has discussed assembling some empty land for redevelopment. Discussion of green infrastructure is a major part of the Detroit Future City planning guide, released in January 2013 as a long-term blueprint for Detroit’s revitalization, with a special eye toward utilizing its empty – and emptying – acreage. The plan called for a “gradual depopulation” of the area that includes Eden Gardens for alternative uses such as agriculture, aquaculture, energy fields and forests while respecting the needs of residents who remain as the population dwindles. The Future City plan is not official city policy, but Tom Lewand, the mayor’s top economic development aide, called it his Bible last year in an interview with the Free Press. In February, Duggan appointed a new city planner, Maurice Cox, who had been director of the Tulane City Center in New Orleans and associate dean for community engagement at Tulane University’s School of Architecture. It will be his job to help determine what the city will do with its 110,000 vacant lots. Meanwhile, Knox and her young and old compatriots charge on. They’ll paint over graffiti and clean along Gratiot June 6. And students from Germany are scheduled to come this summer to help in Eden Gardens. Employees from Fiat Chrysler Automobiles sometimes help out. While the employees usually volunteer with local nonprofits and rarely received cold calls from neighborhood groups, but Eden Gardens reached out to them, a spokeswoman said. And residents will cut the grass and weeds in the neighborhood’s vacant lots all summer. Isn’t that the city’s responsibility? Knox was asked. “I don’t even worry about them anymore,” she said. I don’t blame the people of Detroit. I wouldn’t want to live there staring at burned down homes either. That would be very depressing. I know this is not a perfect solution and there are a lot of “if’s” but if the people are willing to do the work, and tear down a building, why can’t they? (Buildings with steel and cement are not included.) Like I said, there are a lot of “if’s” such as: If the building has been burned down, if it’s been abandoned and is on the enormously long demolish list of Detroit, and if the city is willing to come and pick up the piles, if any volunteer (aka the people) will not hold the city responsible for any injury in demolishing a building, if electricity, gas, water have all been shut off, and I’m sure there are tons of other “if’s I’m not thinking of as well; then why can’t they break it down? You don’t need a huge machine to take down a home. Is it faster; of course. Is it more expensive; absolutely. Last I knew if you had a sledge hammer, maybe an ax and a lot of muscle and desire you can tear anything down. I can hear the lawyers and safety officials already. This is common since people. There is a need, there is a lack of money. There is a lot of work that needs to be done. This is OUR city and if people want to rise and take part in rebuilding it, I say the City should find a way and let them. This is an excellent and informative essay by Bill McGraw. I am glad to see the mayor visited this area. It would be interesting to know how many other such neighborhoods there are. Three cheers for the fortitude demonstrated by Karen Knox and her small army of urban homesteaders. I am sure that she and her partners feel like guerrillas in a war of attrition. It is through the efforts of brave souls like Ms. Knox that Detroit will be the Phoenix of the next decade. A thumbs up for the new Mayor for reaching out to the citizenry even if he can only offer hope. It would seem that a local foundation would step up and adopt the community of Eden Garden and reward the courage of its residents, think of them as the living DIA. Excellent article, Bill. It captures the inner strength present in so many Detroit neighborhoods -- strength that can flourish if given some assistance. The funders and investors of the 7.2 sq. mi. area of downtown/riverfront/midtown need to understand that their efforts will fail in the long run if the 7.2 sq. mi. "tomorrow land" is not connected to the 131.8 sq. mi. of potentially viable neighborhoods that form the rest of the city. So far, that reality has not struck home. I applaud these residents, and admire what they're doing. I grew up at 12323 Glenfield, 5 houses off Annsbury, between Annsbury and Roseberry. My parents sold the house in 1973. It's no longer standing, sadly. It was a wonderful community. Best of luck to the residents in their fight to improve their neighborhood. This article broke my heart....I lived on the corner of Rosemary and Barret and graduated from St. David's High School...the neighborhood was meticulously cared for and so beautiful back in that era...walking to school down Outer Drive was gorgeous....the houses and lawns and flowers...this article brought tears to my eyes...all my friends lived in those homes...families with 10 and12 and15 children....we never even had to lock a door....it is a wonderful feeling to know someone cares about the beautiful homes around there....if I was in better shape I wish I could help....it is a wonderful thing that you are doing...I want to drive down and see it. I moved in this neighborhood in 1978. My son and daughter attend St. David briefly. I remember when there was air show from the City Airport, Big Boy restaurant, Haas restaurant on the corner of Outer Dr. and Gratiot, Lincoln Mercury car dealers on Gratiot. It breaks my heart to have seen the hay day of this area and Detroit and to have to live and see this area today.Thanks for your reply. I hope you can stop by one day. I and my brothers went to St. David School. Even though we lived closer to the south side of the parish, all our friends lived in this and the surrounding areas and it was our stomping grounds. It is heartwarming to see what these people are doing. Is there a way to help out? I would live to help. On June the 27th we will began our board up and clean up starting at 8:00 AM. We will meet behind Payless Shoes on Glenfield. Please come join us. I'm not from that area, but my girlfriend did live not far from there on Kennebec. For any old timers on here, her and I would go to Geigers drive-in then to the submarine races at City Airport.